Any query of these tables hard crashes QuickBooks! There is no entry in QODBC log. 20170730.171449 I 7784 QBSDKProcessRequest Application named 'FLEXquarters QODBC' starting requests (process 7196). 20170730.171450 E 7784 StorageInterface *** UNKNOWN EXCEPTION THROWN WHEN PROCESSING THE QUERY REQUEST ***. 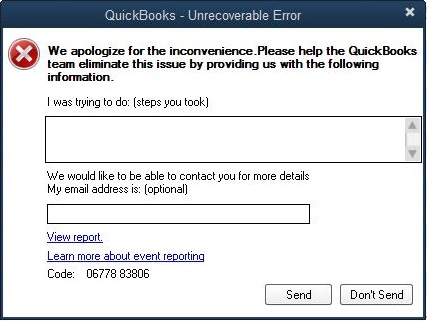 This is an indication of a possible internal QuickBooks error. When you face this type of error, Please refer QuickBooks SDK logs. When you see error *** UNKNOWN EXCEPTION THROWN WHEN PROCESSING THE QUERY REQUEST *** in QuickBooks SDK logs. You should test the same on another company file to see if the issue is related to company file or not. If you are still getting the same error in QuickBooks SDK logs with other company files, then There might be some internal error occurred in processing request. To resolve this error you need to get in touch with Intuit.